Dallas native Robert Kaufman has gained much popularity amongst the Pace community in his first two years of teaching English in the Upper School. In Mr. Kaufman’s class, he strives to bring out the creativity and non conformity within his students, steering them away from their main focus: grades. He will often take his class outside for class to enjoy the weather along with the discussion. After his adventures in Norway, Mr. Kaufman returned to America and went to law school. He soon learned that pursuing a law degree was not his passion or a job he would love. While in law school, he simultaneously taught at a Hebrew school and took a graduate poetry class, which he found was his true passion. Mr. Kaufman then began teaching 11th grade English in Dallas, but decided he wanted to teach more complex books and poetry. In order to do so, he felt he needed a more advanced education, so he studied poetry at Dartmouth, where he earned his Master of Arts degree. Many Pace students know Mr. Kaufman for his originality and creativity, seen mostly through his hobby of scrapbooking. During his undergraduate years, he studied abroad in Stockholm, Sweden, but returned with no souvenirs. So, when he went to Norway to teach, he brought along an empty accordion binder and filled it with postcards, receipts and pictures. When he returned, he decided to put them all in a book of his trip. “I think [scrapbooks] are very cool and uncommon,” said Mr. Kaufman. “Even though it’s not that artistic, it’s very original.” Since then, he has created scrapbooks dedicated to Texas, his trip to Europe this past summer, his first year at Pace and other themes. He began truly enjoying writing and reading his own poetry aloud in the summer of 2012 when he took a trip overseas to Iceland. “I intended to write a novel but then I met a girl and that novel came to be a poem about her and then about Iceland,” said Mr. Kaufman. At Dartmouth, he wrote his first book of poetry, where each poem is based on a specific letter of the alphabet. He won the Thesis Excellence Award at Dartmouth for the most outstanding writing amongst his class. Mr. Kaufman often tries to attend and read his poems at open mic nights and poetry events around the Atlanta area. He performed at a poetry slam night at Java Monkey in Decatur this fall and encouraged his students to attend for extra credit. Once a week, Mr. Kaufman veers from the discussion of the books his classes are reading and instead holds “Poetry Friday.” He teaches his classes poems and songs from all different genres and themes including rap, contemporary, historical and philosophical, in order to actively engage each student’s interests. 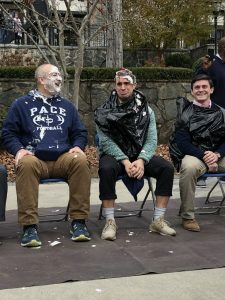 “From having students write poems to doing art projects where they grade themselves and assigning personal writing, I hope every kid at Pace understands that even if you are not a full time artist, all of us have creativity,” said Mr. Kaufman. He encourages students to think for themselves, which is why he emphasizes a strong thesis in his writings. He does not want the students to reiterate what was said in class but instead to create their own path, originating from his days at Brown.